Heba Amin, Caram Kapp and Stone are known as the “Arabian Street Artists". They were recently hired by the TV series to add “graffiti authenticity” to the shows set. The graffiti was added to Berlin set walls that are meant to represent a Syrian refugee camp. And that is exactly what they did. Throughout this second episode numerous slogans in arabic criticizing the show are shown all over. 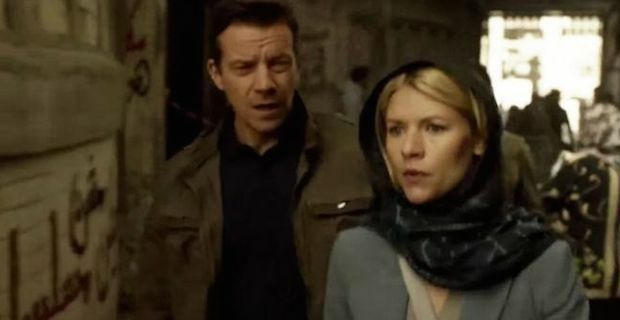 One stating "Homeland is racist" can be seen when Carrie Mathison, played by Claire Danes walks past one of the walls. Other statements state, “Homeland is NOT a series”, “The situation is not to be trusted”, “This show does not represent the views of the artists”, “Homeland is a joke that didn’t make us laugh”, “Homeland is a watermelon” and many more. Surprisingly though the set designers completely missed these messages and the show went on to air in the States. One of the directors of the show Alex Gansa talks about the incident. “We wish we’d caught these images before they made it to air. However, as Homeland always strives to be subversive in its own right and a stimulus for conversation, we can’t help but admire this act of artistic sabotage.” We will have to wait and see though if they altered or erased the slogans when it airs in the UK on Sunday.